The EURO-k conference series roams the continent, with a stop every couple of years to bring together the Operational Research community for a few intense days of knowledge exchange; the 2018 installment would be held in Valencia, Spain. As one of the few OR practitioners at my new workplace, I was able to negotiate time off and funding for the conference and travel, in exchange for covering the hotels and other costs myself. With talks running Monday to Wednesday, I took my usual approach of travelling in my own time in advance to create some sightseeing opportunities; flight schedules also gave me a decent amount of the Thursday to explore too. I knew nothing about Valencia other than that it would be hosting the conference, but the organisers advertised its connections to the futuristic City of Arts and Sciences, which would be used for several talks and social events. This site – housing the opera, gardens, museums, a planetarium, cinema and an oceanarium in a series of dramatic structures – looked like a purpose-built playground for an architectural photography geek such as myself, and sure enough I found myself drawn back there several times both for the conference and during my own wanderings. But Valencia turns out to have a little bit of everything – carry on to the coast and you’ll find both a major port and several beaches, whilst inland a historic old town nestles in the centre and a ‘zooimmersion’ biopark offers a more faithful recreation of the African habitats of its animals. Tying all these together is a 10km linear park running through the city, following what used to be the route of a river, and still crossed by the original bridges. There’s also plenty of public transport: buses, trams and a metro; plus a network of hire bikes. All of which sounded ideal for me – except visiting Spain in July turns out to mean 30-something temperatures from mid-morning to late evening, which limited my activities somewhat (although I still had to scurry between lecture sites at all hours of the day). Nonetheless, I braved the heat – foolishly hiking much of the park – on Sunday morning to pursue another growing photographic interest of mine, capturing street art. In particular, I had learnt of the unknown couple whose London kiss in 2012 had been turned into a Valencian mural in 2016; part of La Calle de Colores. Once on this ‘street of colours’ (an otherwise easily-missed single lane road, Carrer de Moret) I realised it was actually the site of several artworks I’d been hoping to track down. But by happy accident I noticed an unfamiliar piece on an adjoining road, which lead me to another, and another… an hour later I was thoroughly lost, but happily so, having roamed a maze of side streets decorated in a wide range of styles. Whilst I can’t offer any precise directions, I suspect from my experience that I don’t need to- just dive in and see what you find. On Thursday I bused to the Bioparc for opening time, squeezing in a visit before it got too hot or I had to make my way to the airport. I often have mixed feelings about zoos, but if they were all like this, I’d have far fewer concerns. With exclusively African animals there were none that seemed subjected to an inappropriate climate for the sake of completeness – although a few residents were definitely taking it easy on this particularly hot morning – whilst the immersive setup is far preferable to more cage-like arrangements. Ryanair offer direct service between Bristol and Valencia, but only on Mondays and Fridays, which didn’t work well for the conference schedule. Thus I booked with KLM, although my BRS-AMS-VLC routing would involve a trio of airline brands with only one leg on KLM ‘proper’. Between Bristol and Amsterdam I was in the care of Cityhopper, whose Embraer fleet (and ‘tasty snack’ boxes) I’ve become a big fan of during our regular flights along this route. The last time I flew with a connection was back in 2014, for the Jersey ‘do’; the Schiphol experience was notably smoother than memories of Gatwick and Heathrow, despite the need to switch to and from the Schengen zone for these flights. I even managed some time in the lounge on the return! 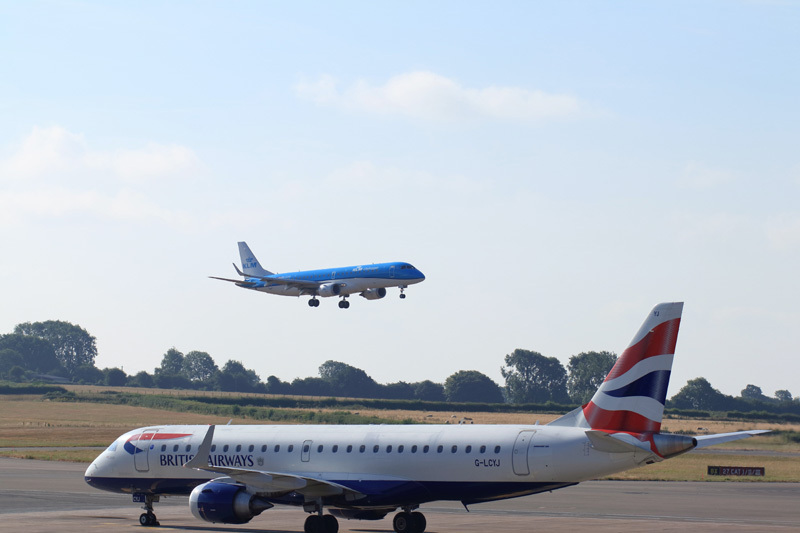 Cityhopper and CityFlyer: PH-EZO on arrival from AMS (where it would soon take me) and G-LCYJ operating one of BA’s few services via BRS. For Amsterdam -> Valencia the timings (and pricing) worked best with a Transavia flight. I had previously flown with them to Gran Canaria, but rather than face nearly five hours of their less generous seat pitch had paid extra on that occasion for some additional leg room. An unfortunate quirk of booking via KLM is that neither their nor Transavia’s website can offer you seat selection, paid or otherwise, so this time I had to settle for what I was assigned. It was also unclear which baggage allowance should apply; for the itinerary as a whole, I was seemingly entitled to 2 pieces in the cabin, but at boarding they were asking for second items to be surrendered to the hold. As I had a checked luggage allowance anyway, I’d planned ahead and only turned up with the camera bag by way of carry-on, so never had to (literally) argue my case. The slimline seating was indeed tight, but not intolerably so for a couple of hours; and I’ve mostly made my peace with buy-on-board catering (including stroopwafels as part of a combo-deal softens the blow). Travelling back, I finally flew a mainline KLM service. Although both this and the outbound were operated on 737-800s, I scuppered the possibility of a like-for-like comparison by paying out of my own pocket to sit in the economy comfort section. I did this partly for the legroom, but mostly to improve my chances of a successful connection by being seated nearer the front. At the time of booking the best I could get was row 6, but by departure the business cabin had shrunk to a mere 2 rows and so I shuffled into 3A during check-in. This also got me to the front of the queue for the meal service; I was surprised to be presented with a hot meal, and although there was no choice the pasta dish on offer was suitable for vegetarians too. But I think my original assessment holds: for a journey of this length, I wouldn’t want to hang around for a later KLM-operated flight (or pay substantially more for one) to avoid a more conveniently scheduled Transavia one. VLC was a new airport for me – possibly the only one I’ll gain this year! KLM’s pair of check-in desks only open two hours before departure, but a queue had formed well before then, which took me half an hour to reach the front of. By contrast security was breezed through in less than five minutes, so I still had a fair amount of time for the ‘VIP’ lounge. The Sala Joan-Olivert can be accessed via priority pass as well as by any business class passengers, and for either of those categories I’d recommend it – but I wouldn’t otherwise stump up the cash asking price! Since I was arriving at the weekend, first up was the Holiday Inn Express Valencia – Ciudad Las Ciencias. As the name suggests, this was ideally located for the City of Arts and Sciences, so seemed a good base for my limited sightseeing time; two nights here were also easy on the wallet (especially after an 8.5% rebate via Topcashback) and aligned with my Accelerate needs. It’s rare that a Holiday Inn Express strays from the template, and although this one had a couple of quirks – there’s a swimming pool, but no restaurant – it fulfilled the usual reliable but unremarkable role I’ve come to expect from the brand. For the conference itself, though, I swapped to the Melia Valencia. Despite the name, this is actually the less central of the two Melia properties in Valencia; for a purely leisure trip, the Melia Plaza is better located (although correspondingly pricier). However, for my purposes this was a more convenient pick than closer options (including just staying on at the HIX), as the tram line through the university campuses runs to the nearby convention centre. 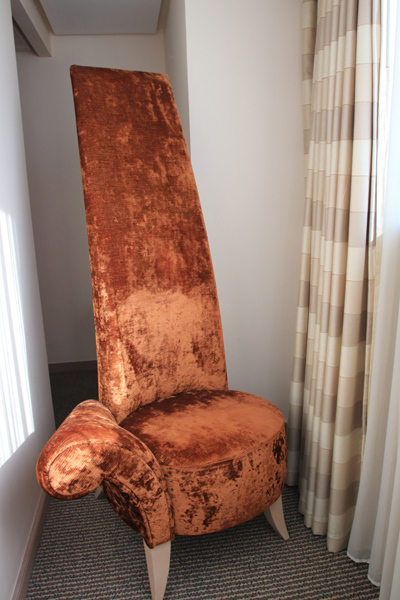 A corner room gets you an extra bank of windows… and this seat you can’t see out of them from. Nonetheless, everything was good quality, with plenty of space and a decent bathroom – it was a notable step up from the previous nights. Breakfast was an extensive buffet where I found plenty to enjoy, but I managed to have not one but two disappointing evening meals on site: the restaurant menu is limited, with a bland slab of fish on a few veg not justifying its asking price; whilst a quick dish of gnocchi from the bar turned out to be too quick, as they were simply undercooked. Dining aside, I’d happily book a room at a Melia again – in Spain in particular, they offer better coverage than brands I’m more used to, so I was glad of the opportunity to check one out.